Panyu, formerly romanized as Punyu,[b] is a district of Guangzhou, the capital of Guangdong province in southern China. It is the site of the oldest parts of Guangzhou, dating back to the Qin Empire, although it was a separate county-level city before its incorporation into modern Guangzhou. The present district covers an area of about 530 square kilometres (200 sq mi). Panyu lies at the heart of the Pearl River Delta, its boundary straddles from latitudes 22.26' to 23.05', and sprawls from longitudes 113.14' to 113.42'. Facing the Lion Sea in the east and the estuary of the Pearl River in the south, its eastern border is separated from the Dongguan by a strip of water, and the western border of Panyu is adjacent to the cities of Nanhai, Shunde and Zhongshan, while it abuts the downtown of Guangzhou in the north. The site of the People's government of Panyu is Shiqiao which is 17 kilometres (11 mi) from downtown Guangzhou and 38 and 42 nautical miles (70 and 78 km) from the cities of Hong Kong and Macao respectively. A Chinese lacquerware box with the "Panyu" name on its surface, dating from the Qin Dynasty. The Chinese settlement at Panyu was established by the Qin armies under Zhao Tuo during their first failed invasion of the Baiyue in Guangdong in 214 BC. There are at least 11 separate theories on the etymology of the name. Upon the fall of the Qin, Zhao Tuo established Panyu as the capital of his kingdom of Nanyue in 204 BC. Archaeological evidence shows that it was a burgeoning commercial center: among the present material object remnants, there are those of Southeast Asian, Indian, and even African origin. Yuexiu District, most of Baiyun and Huangpu Districts, and parts of parts of Liwan, Haizhu, and Tianhe Districts were originally part of Panyu County but were ceded to Guangzhou as it expanded. On 20 May 1992, Panyu County was upgraded into a county-level city and, on 21 May 2000, Panyu was fully converted into a district of Guangzhou. By 28 April 2005, the southern part of Panyu was split off as the new Nansha District. On 30 September 2012, three southern towns of Panyu—Dongchong, Dagang, and Lanhe—were removed to Nansha's jurisdiction. 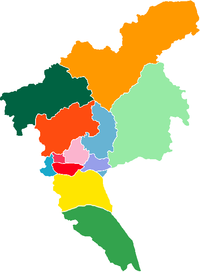 Panyu district administers ten subdistricts (街道) and six towns (镇). The district executive, legislature and judiciary are based in the Shiqiao, together with the CPC and PSB branches. On 1 December 2012 three towns (Dongchong, Dagang, & Lanhe) were transfer to Nansha District. The following towns have been abolished, some by absorption into the Development zone of the Nansha District. Under its various Subdistricts and Towns (and in the one Development zone), Panyu has 305 administration villages - i.e. 305 village governments. There are other 'natural villages' (自然村) which administratively count as being in one or another of the official villages. Statistics shows that in the year of 1998, the GDP in the district was 33.25 billion yuan, an increase of 13% over the previous year, and the GDP per capita was 35.5 thousand Yuan, an increase of 11%, compared with the previous year. Guangzhou Metro Lines 2 and 3 serve parts of Panyu District. Line 2 was extended into the district in Sept. 2010. Guangzhou South Station, the main high-speed railway station serving Guangzhou, is situated within the boundaries of Panyu District. Panyu Public Transport operates buses in the district. Yuyin Mount Garden：One of the four famous gardens in Guangdong Province in the Qing Dynasty. ^ Often mispronounced as Fānyú. ^ Panyu was also formerly romanized as Pwan-yu. ^ Encyclopædia Britannica, 9th ed. (1878), Vol. V, "China". ^ Yi Song-mi Erickson, Susan N.; Nylan, Michael (2010), "The Archaeology of the Outlying Lands", China's Early Empires, p. 163 . ^ "Baomo Garden - Guangzhou through a lens - Cities & Towns - Newsgd". ^ "World Second Night Zoo Built in Guangzhou". ^ "Guide for Foreigners in Guangzhou" (Archive). Foreign Affairs Office of the Guangzhou Municipal Government (广州市人民政府外事办公室). p. 32/74. Retrieved on August 17, 2015. "Guangzhou Korea School Add: Jinxiu Xiangjiang Estate, Nancun Town, Panyu District, Guangzhou"
^ "Council resolution of Prague 5th district approved on April 14 2015". Dichong Station (Chinese: 低涌站; pinyin: Dīchōng Zhàn; Jyutping: dai1cung1 zaam6) is an elevated station of Line 4 of the Guangzhou Metro. It started operations on 30 December 2006. It is located at the junction of Nande Road and Qianqing Road in Shiqi Town (石碁镇), Panyu District. Guangzhou Higher Education Mega Center (HEMC), Guangzhou University Town or Guangzhou University City (Chinese: 广州大学城) is an area featured by higher education institutions, located on Xiaoguwei Island (Chinese: 小谷围岛) in Panyu District, Guangzhou, China. It was opened in 2004. With an area of approximately 17.9 km2 and 3.53 millions square meters of indoor space, the complex is capable of accommodating 350 to 400 thousand people. Guangzhou Korea School (Chinese: 广州韩国学校, Korean: 광저우한국학교) is a South Korean international school within the Jinxiuxiangjiang Primary School (锦绣香江小学) located within the Jinxiuxiangjiang Apartment (绣香江小区) in Nancun Town (南村镇), Panyu District, Guangzhou.In 2011 Kim Jang-hwan, the consul general of South Korea to Guangzhou, revealed that a Korean international school was opening in Guangzhou. Many Koreans lived in Panyu District so the school was scheduled to be located there. The Chinese Ministry of Education approved the school as a school for teaching foreigners on July 24, 2013. Guanqiao Station (Chinese: 官桥站) is a future elevated station of Line 4 of the Guangzhou Metro. It will be located at Guanqiao Village (Chinese: 官桥村), Shilou Town (Chinese: 石楼镇), Panyu District. It will also be available for use when necessary in nearby areas. Hanxi Changlong Station (Chinese: 汉溪长隆站) is an interchange station on Line 3 and Line 7 of the Guangzhou Metro that started operation on 28 December 2006. It is located under the east side of Hanxi Avenue (汉溪大道), the Xinguang Expressway (新光快速公路), and the south of Chime-Long Paradise Amusement Park in the Dashi Subdistrict (zh) of the Panyu District of Guangzhou. There is a free shuttle bus connecting the station with the amusement park.Before the station started operation, it was called "Hanxi Station" (汉溪站) and "Changlong Station" (长隆站) successively. The residents nearby were disappointed with the name "Changlong Station" because they felt that the name favoured the Chimelong Group, Chimelong Paradise's owner and operator. The Guangzhou Municipal Government later approved a change of name to "Hanxi Changlong Station" which satisfied both the residents and the enterprise. Higher Education Mega Center North Station (Chinese: 大学城北站) is a station of Line 4 of the Guangzhou Metro. It started operations on 26 December 2005. It is located at the underground of the north of Guangzhou Higher Education Mega Center, located on the Xiaoguwei Island in Xinzao Town (新造镇), Panyu District.The station was previously called "Beiting Station" (北亭站) because of nearby Beiting Village (北亭村) on the island. But since May 2006, it changed name to Higher Education Mega Center North Station. Higher Education Mega Center South Station (Chinese: 大学城南站) is an interchange station of Line 4 and Line 7 of the Guangzhou Metro. It started operations on 26 December 2005. It is located at the underground of the south of Guangzhou Higher Education Mega Center, located on the Xiaoguwei Island in Xinzao Town (新造镇), Panyu District.The station was previously called "Nanting Station" (南亭站) because of nearby Nanting Village (南亭村) on the island. But since May 2006, it changed name to Higher Education Mega Center South Station. Huijiang Station (Chinese: 会江站) is a metro station on Line 2 of the Guangzhou Metro located under the junction of Shibei Avenue (石北大道) and Shizhong Second Road (石中二路) in the Panyu District of Guangzhou. Humen railway station (Chinese: 虎门站), formerly Dongguan South railway station (Chinese: 东莞南站), is a station in Baisha Village (Chinese: 白沙村), Humen, Dongguan City, Guangdong Province, China. It is one of the stations on the Guangzhou–Shenzhen–Hong Kong Express Rail Link between Guangzhou South railway station in the Panyu District and Futian railway station in Shenzhen City.Humen railway station is connected to Dongchong Town in the Panyu District by the 10.8 kilometres (6.7 mi) long Shiziyang Tunnel under the Shiziyang Channel near the estuary of the Pearl River. The tunnel was completed in March 2011. Lanhe (榄核镇) is a town in Nansha District, in the municipal region of Guangzhou, Guangdong, China. Luoxi Station (Chinese: 洛溪站; pinyin: Luòxī Zhàn; Jyutping: lok6kai1 zaam6) is a metro station on Line 2 of the Guangzhou Metro. The underground station is located in Xinpu Road (新浦路), Luoxi Island in the Panyu District of Guangzhou. Panyu Square Station (Chinese: 番禺广场站) is a terminus of Line 3 on the Guangzhou Metro that started operation on 28 December 2006. It is located under the junction of Donghuan Road (东环路) and East Qinghe Road (清河东路) in the Shiqiao Subdistrict, the seat of Panyu District. Panyu Square is a newly developed area to the south of Shiqiao, surrounded by the new Panyu Government Offices (新番禺区政府大楼), hotel and high-rise buildings. Patrick Tse Yin (born Tse Ka-yuk; 9 August 1936) is a Hong Kong actor, producer, screenwriter and director in Hong Kong cinema. Shibi Station (Chinese: 石壁站; pinyin: Shíbì Zhàn; Jyutping: sek6bik1 zaam6) is an interchange station of Line 2 and Line 7 of the Guangzhou Metro. The underground station is under Shibi Village (石壁村), Xiebian Highway (谢边公路), Panyu District, Guangzhou. It started operation on 25 September 2010. Shiqi Station (Chinese: 石碁站; pinyin: Shíqí Zhàn; Jyutping: sek6gei1 zaam6) is an elevated station of Line 4 of the Guangzhou Metro. It started operations on 30 December 2006. It is located at the junction of Shilian Road and Jingzhu Expressway in Shiqi Town (石碁镇), Panyu District. Shiqiao (Chinese: 市桥, pinyin: Shìqíao) is a street committee of Panyu District, Guangzhou, Guangdong Province. It lies at the heart of Panyu, covers an area of 11.35 square km, and has a population of more than 280,000. Shiqiao is the political, economic, cultural and commercial centre of Panyu District, and has direct jurisdiction over 28 communities and 8 villages. Shiqiao Station (Chinese: 市桥站) is a station of Line 3 of the Guangzhou Metro. It started operations on 28 December 2006. It is located at the underground of the junction of Guangming Road North and Qiaoxing Avenue, Shiqiao Subdistrict, the seat of Panyu District. Xiajiao Station (Chinese: 厦滘站) is a station on Line 3 of the Guangzhou Metro that started operations on 28 December 2006. It is located under Xiajiao Village (厦滘村) in Luoxi Island, Panyu District of Guangzhou. It is near Wuzhou Decoration Center, Shaxi Plastic Center, the White Palace Hotel and the White Palace Theater. Xinzao Station (Chinese: 新造站; pinyin: Xīnzào Zhàn; Jyutping: san1zou6 zaam6) is a station of Line 4 of the Guangzhou Metro. It started operations on 26 December 2005. It is located at the underground of Zengbian Village (曾边村), Xinzao Town (新造镇), Panyu District. It was the terminus of Line 4 before the route between Xinzao and Huangge started in service on 30 December 2006.